The Sound Transit Board’s capital committee on Thursday made the early construction of the North 130th St. more likely. The agency’s staff and elected leadership also continued to express concerns about the Trump administration’s hostility to transit projects. The committee also voted to elevate Downtown Redmond’s new Link station, change the Federal Way Link federal grant proposal, study improvements to Seattle RapidRide, and install new diagnostic units on light rail vehicles. As we predicted Wednesday, the North 130th St. Link station got one step closer to opening at the same time as the Lynnwood Link Extension in 2024, instead of 2031. The Sound Transit Board’s Capital Committee encouraged (but did not formally vote to recommend) a plan for ST staff to begin preliminary engineering on the station. Until today, the board’s Snohomish County officials opposed building the station before Everett got Link service. Edmonds Mayor Dave Earling, the only Snohomish County official on the committee, supported the move to begin engineering work. Earling’s cautious endorsement of the move was a victory for Seattle officials, especially City Councilmember Debora Juarez, who campaigned on the issue. In his comments during the meeting, Earling emphasized that he didn’t represent the board’s Snohomish County bloc, and that his approval of the engineering phase wasn’t a vote for including the North 130th station in the Lynnwood extension. “The ongoing concern in Snohomish County is about the potential downsides,” Earling said, referencing an ST staff presentation about the station. The presentation included positives like lower costs and avoiding service disruption; the negatives were “modest” effects on the agency’s funding capacity, technical staff, and construction workforce. Based on the tenor and content of the presentation, agency staff seem to prefer the accelerated timeline. So North 130th’s accelerated schedule isn’t a sure thing, though today’s vote does represent a subtle shift in Snohomish County officials’ positions. Board and Seattle City Councilmember Rob Johnson attributed Snohomish County’s reluctance on North 130th to apprehension about an increasingly hostile attitude from the federal government towards transit. Johnson said that moving up North 130th will require ST to negotiate changes to its FTA funding package for the Lynnwood extension, and suggested that process would gives the Trump administration more chances to torpedo any and all Sound Transit projects. Johnson also said that there’s a perception up north that Snohomish County isn’t getting a fair shake. In any case, the whole board has yet to approve the measure. In fact, no part of the board has—the Capital Committee itself didn’t have quorum to actually vote on the motion. Earling, and board meeting stalwarts Dave Upthegrove, Balducci, and Johnson were all present at the beginning of proceedings. Upthegrove left partway through the meeting to attend another obligation, but had trouble staying connected via phone. Committee members Kent Keel, Nancy Backus, John Marchione, and Victoria Woodards all skipped, and didn’t try to call in. Several other measures, however, got a vote before Upthegrove lost contact. The committee voted to elevate the Downtown Redmond terminus of the line, per the recommendation of the Redmond extension staff. If the changes are approved, the alignment will be 0.3 miles shorter than before, due to newfound efficiencies. The Federal Way light rail extension has a higher funding contingency estimate. Sound Transit CEO Peter Rogoff said that the Federal Transit Administration (FTA) wants partner agencies to build more conservative estimates for contingency funding in their grant requests. Sound Transit was asked to build a model that will be at or under budget with 65 percent certainty. The old model asked for 50 percent certainty. According to agency staff, Sound Transit is 85 percent certain that the Federal Way project will cost $2.451 billion or less, after the latest cost increase. The committee passed a motion that would spend $2.5m to study improvements on Metro’s RapidRide C & D routes, while the agency plans the new West Seattle and Ballard Link lines. Improvements could include signal priority, retiming signals, que jumping, rechannelization, and pavement treatment. The Sound Transit funds will pay for ST staff for the project, preliminary engineering, and a speed and reliability study of both routes. The funds will come from the $65 million agency budget for “early delivery” projects on ST3 corridors, which also includes the Madison BRT project. The capital committee recommended Sound Transit engage Fehr & Peers, Seattle-based transportation consultants, to study improvements to North Sounder park and rides. The committee also approved a plan to purchase and install new WiFi-based diagnostic units (which monitor vehicle performance and ridership) on existing and future light rail vehicles. The existing units are no longer supported by the manufacturer. Is there a possibility Sound Transit could help accelerate Rapid H that goes through West Seattle to Burien by sharing or using a portion of the capital improvements to the C line? The line would likely be an important feeder to the Delridge station in the future. Probably only in shared segments. But when West Seattle Link opens the H will be the only RapidRide line going from West Seattle to downtown, so in that sense it will inherit them. And given that the speed north of Delridge affects performance south of Delirdge, it may be an indirect benefit. If West Seattle pressures ST to design any alternative with a tunnel, Link will be further delayed. That’s probably ok since the West Seattle stub years will require a double transfer to get to Downtown Seattle with one of those segments being a potentially overcrowded segment in a rail corridor under construction in SODO and have a rail-rail transfer that will involve at least 40-50 steps. Keeping full RapidRide service going during this period seems very likely. Investing in RapidRides C and H seems like a very good investment because it will be the transit lifeline for West Seattle until 3035 and maybe longer. If I read that right, that’s $2.5 million for a study. That’s not planning, design or construction, but a study. I mean, I could give them a list of projects on the D line right now that they could spend that $2.5 million on actually implementing, rather than studying. A freebee: take a can of paint and change the BAT lane signs to 24 hours buses and turns only.. The article suggests that it’s for staff! That’s not doing a study but attending meetings and reviewing documents. As horrible as it may sound, getting all the agencies in regular meetings should be the norm and not funded by special motions. Matthew is raising a great question. Spending ST3 money on the Delridge-White Center H Line could be a wise use (despite the fact my own primary transportation is the C Line), for reasons that I’ll save for a newspaper story. This is exactly the point I raised in my comment earlier this week on the other post on this subject matter (prior to the capital committee meeting). STB’s Dan Ryan responded with a reply indicating that ST MUST have assurances from the FTA that this plan to accelerate the 130th street Link station won’t impact the FFGA for Lynnwood Link. So I’ll ask again: does STB have anyone at ST on the record to back up this assertion? Secondly, I have to comment about two other points that the above post brings up. One, just so everyone is clear, the Snohomish County contingency on the entire board consists of just three members, so Dave Earling being the only SnoCo representative on the capital committee is not surprising. Two, what’s the deal with so many no-shows by the committee members that they eventually lacked a quorum to take votes? These folks have an obligation to attend or at least phone in for these meetings (despite their other obligations). They make a mockery of the process with such behavior and the constituents they represent should hold them accountable. There’s a persistent idea that 130th is a waste, or at least a low priority, because there’s not much housing in the immediate vicinity of the station. 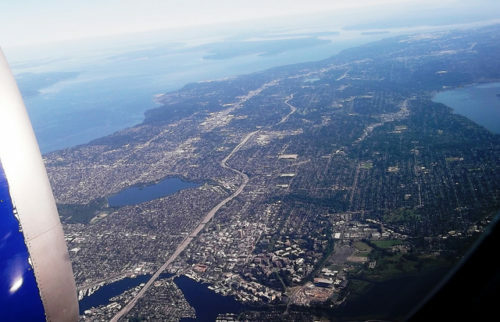 But it overlooks that 130th will, for the foreseeable future, be by far the best connecting point from two denser areas that have some of the little naturally affordable housing left in Seattle: Lake City and Bitter Lake. Metro gets this, and its long range plan includes the frequent bus line along 130th that would connect both of those neighborhoods with Link efficiently (and would also connect them with each other, a trip that now requires a long walk from 5th NE to Meridian or a detour to Northgate). Getting the station and that bus route in place will be a major improvement in mobility in North Seattle. David Lawson is correct. With ST Link alignments in freeway envelopes, this is a nearly universal issue. STB and ST seem to be committing a typo. the subject station would be at Northeast 130th Street, not North 130th Street. I hope the station design includes pedestrian crossings along Link of NE 130th Street that are not at grade. riders do not need to cross at grade as they do at Mt. Baker and SeaTac (to southbound A Line and Route 156). >> With ST Link alignments in freeway envelopes, this is a nearly universal issue. Good point. There really won’t be very many stations north of Roosevelt with a really big set of walkup riders. I would be surprised if any of them have more than a couple thousand people. But ST is building huge, very expensive park and ride lots to at least get decent numbers. Good connecting bus service can get way more than that. It isn’t just about the numbers, either. Not only will it be a major improvement for riders from Lake City and Bitter Lake, but it will also improve the transit network. Right now it is extremely difficult to ride a bus from one side of north Seattle to the other, despite the relatively high population density (which is higher, of course, than anywhere in Snohomish County). Lake City to Greenwood (or anywhere on Aurora) is ridiculously difficult (most people just drive). The new station will change that. Metro should have no trouble justifying a crosstown bus, which will change the perspective in the area. The Northgate detour will go away, and folks won’t be burdened by the high cost of driving (or calling a cab) just to take a simple, fairly short, fairly common trip. I believe that Seattle should ask ST to build a station that straddles 130th and leave the provision of bus pads and stops to the City. The bridge really must be widened in order for the bus-intercept potential there to be achieved. If WSDOT and ST have to pay for improvements, WSDOT will embargo stops from the bridge — rightly, because of the narrow sidewalks — and the stops will end up east of Fifth NE. That’s terrible. The City needs to be prepared to spend $20 million or so to widen the non-roadway portions of the bridge significantly. The sidewalks should be replaced with station platforms over the northbound lanes with a bikeway behind the shelters. The western half of the bridge can be somewhat narrower, but must be widened also. If all that’s not complete by the opening of Lynnwood Link, at least have the train platforms complete and the passenger shed roughed in. Based on looking at the satellite images, the 4 lanes are mainly needed for drivers to use the left lane to access the I-5 SB ramp. These drivers have to block the left lane of traffic to make the turn. Effectively, *there already IS only one westbound lane* in this situation! This situation is very bad since people also want to use the left lane to pass! If this is the case, a center turn lane should be sufficient to put in bus stops, and alleviate the traffic safety issue for motorists–a win-win. Plus, the left turn is across a single lane of traffic instead of two lanes–also safer. If the volume is indeed too much for two lanes plus a turn lane, a traffic signal is probably called for. There are some locations where the center left turn lane extends more than a block “upstream, ” which is another possibility. Why wouldn’t SDOT at least want to study these options? It is possible it could work. Keep Roosevelt Way as four lanes. Westbound it would be two lanes, with the left lane a left turn only to the freeway. Eastbound, starting at First, it would work the same way. Eastbound, you would ban left turns (onto Fifth), which frankly, is well over due. That all sounds pretty good, except that you will still allow eastbound cars to take a right from 130th to 5th. That isn’t much of a problem now, because there are very few pedestrians there. But with a station and bus stop there, that all changes. Now you have cars stopped to take a right, backing up all of the eastbound traffic (including the buses). I have my doubts it will work. I think in general this is an overblown problem. Richard is absolutely right — the main thing is that the station needs to strattle 130th, just west of 5th. That is the logical place for the station. At that point, you need more room for people to get off the station, and wait for a bus. This means adding space to the bridge — but it doesn’t necessarily mean making it wider across the whole thing. Just add a little pedestrian bulb on both sides, which hopefully would be pretty easy, since it is land (not freeway) underneath there. That does mean a narrow crossing over 130th, but that is the case right now. There really won’t be huge numbers of people walking west — there are few places there. No apartments, and not even any houses to the southwest. Eventually Seattle should widen the sidewalk (just as they should widen a bunch of sidewalks) but it isn’t like 65th, close to Roosevelt (which SDOT felt was just fine with skinny sidewalks). All they need to do is build platforms so that people have a place to stand while waiting for the bus. That really shouldn’t cost much (way less than a typical park and ride). Ross, I agree. What you propose would be fine. The reason I said that the west half would probably need widening is that people were wanting protected bike lanes, and that only works if they go behind the bus bulbs, and the sidewalks are too narrow for people to ride on safely. They could pitch over the railing. But yes, there won’t be a whole lot of pedestrian traffic to the west unless Seattle up-zones for a block or so. That doesn’t seem like much to ask. I agree that it’s necessary to ban eastbound left-turns onto northbound Fifth NE so that traffic isn’t tempted to trespass in the bus lane. But so far as the westbound left turn to the freeway, it seems entirely reasonable to end the westbound bus lane at mid-span and allow “through” traffic to merge into the right lane to pass cars waiting to turn left. The actual left turn point is almost as far west of the bridge as the bridge is wide, so that’s a reasonably long queue. If the eastbound bus lane begins at the eastbound right-turn to the freeway ramp, only a single-lane of traffic would have to be crossed by the westbound cars entering the freeway. There’s a very nice sidewalk along the park on the south side of the street to the west, so the pedestrian facilities there don’t need improvement. Roosevelt to the west of the freeway already has “Sharrows” all the way to 145th and Aurora. I’d suggest that eventually a hole should be punched through the sound wall at the end of Roosevelt and a bikeway down to 130th be added within the freeway envelope. The verge is quite wide at that point. Then finish widening the sidewalk enough all the way across so that a two-way PBL can be added. Yes, if you want to add bike lanes over 130th, you need to expand the bridge. But that is just another bike project, and nowhere near as important as the pedestrian bridge over Northgate. Even that project was somewhat independent of the new station. The Northgate station could have been added without the pedestrian bridge (and that was the original plan). It was only later that the city proposed the bridge (and paid for it with MoveSeattle money, if I’m not mistaken). I don’t see bike improvements over 130th as being especially important (my guess is there are dozens of more cost effective bike improvements). If anything, I think what I would do is improve 5th, and make it a much better bike corridor. The street is ridiculously wide, so it wouldn’t take much at all to add bike lanes there, connecting Northgate to 130th. For a lot of people, it would be faster to bike to 130th than Northgate. Furthermore, I wouldn’t expect a huge amount of bike traffic on 5th, while 125th/130th will likely have a very frequent set of buses. That seems like a cheap, easy win, while a new bridge might not be ready for ten years. Richard, how are protected bike lanes feasible on North 130th Street? east of I-5, it has four lanes and no parallel parking. we want transit to stop in-lane. Intending transit riders get between curb and bus. Let’s do both our funding sources, local and Federal, a favor by redirecting our meeting- minutes to avoiding, rather than giving free advertising to fear. Starting with strong fast preparation to treat a sudden budgetary cutoff as a slow order, not a shut-down. Example: Rail money blocked? Run buses where the tracks are supposed to go. Concrete pads like guided bus-ways do in Australia. Trackway with sockets for pillars, when we can again afford them. Given proven predictability of present Administration, let’s just call this earthquake readiness, and budget money and time accordingly. And word to the wise: average threat is always empowered by attention. Glad you’re here, Mike. Since it’s no longer news that there’s barbed wire across my Free Reading limit, I’m relieved to know that the Delridge-White Center H Line COULD be a wise use of ST3-money. Great credit to you for not revealing what I found out inbound from Fauntleroy. That the C Line is tightly routed to hit every single pavement-juncture between Fauntleroy and Second and Seneca as if it just hit a building. Proof you’ll never “burn a source.” So I’m going to give you something that’ll blow latest NPR anonymousity right out of Elliott Bay Marina. Couple nights ago, my Triple A-Line group was up on the viaduct at LCC, where driver-changes happen. Firm had hired Stormy Daniels to get a white nightgown and tie herself to the tracks. Checking out how much operating time LINK would lose, or gain, average number of times this situation happened. Well, we radio’d next inbound driver to ring his bell real loud when he left Beacon Hill- yeah, should’ve been a whistle, but you know, air quality. Suddenly, allinaflash, a Washington State Patrolman (All their kids star material, their outfit’s motto really is “Service With Humility) was tying his cruiser to the railing, up those metal stairs, and untying Stormy, who by virtue of screaming at him for ruining the scene, thereby did ruin the scene. Boy, Dudley Do-right sure had it Wrong! Script was not improved when Train, ok, when they’re old it’s always “Number Nine” cleared that tube like Felix Hernandez was mad at the guy. Lucky the guy at the throttle had been misinstructed to put a rubber band on the controller handle. Luckily fact that 48 wheels blew themselves to shrapnel when it broke really shortened the accident report. At which time the Mount’s (ok, wrong color but correct take on script) came dashing up the steps, and being a husky, smelled WSU wildcat all over that 587 member. No sweat. Like they ever read these reports. So here’s the deal. You need a highly-placed anonymous source, right? Well, all due modesty, but in my trade, highest placed requires a three step ladder. So copyright is yours so long as you don’t use my name. Results of our simulation that proved fare boxes wouldn’t cost DSTT a single operating minute have just passed budget for ST- ten thousand. 130th should have been the choice all along, with 155th instead of 145th. However, the City of Shoreline had a well-orchestrated effort with their state legislators to downplay 155th as “a quiet neighborhood street,” hoping that decision-makers wouldn’t notice that 185th has the same cross-section and that 155th, unlike 145th, has complete bicycle lanes, sidewalk, and even a parking lot to build a garage on (west of the I-5 overpass). The objective was that having 145th as a station would be the only way to get that street fixed up…and their strategy worked, and millions of dollars is being invested in fixing up 145th, to the extent that’s possible given the limited right-of-way there. Snohomish County politicians should be advocating to deliver Everett Link in at least two parts, with the first being from Lynnwood Transit Center to 128th/Mariner Park & Ride, where riders can connect to/from the Swift BRT Green line to/from Paine Field/Boeing-Everett and Mill Creek. This segment could be up and running by the late 2020s, a benefit to many of today’s commuters while shifting the platoon of buses to/from Everett north of Lynnwood Transit Center for their turnaround.